It’s time for a Retro Review! With the new film Prometheus hitting theaters in the U.S. today, I thought it would be fun to take a look at a classic Alien action figure! 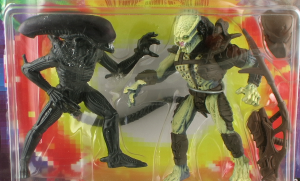 So join me for a look at the Alien vs Predator 2-pack released in 1994 from Kenner! Video after the jump! I did laugh when dan said the aliens were better know as xenomorphs ? i know thats what they are but to me they will always be aliens ! Yeah, these definitely seem to be the most screen accurate of the Kenner lines, I believe. That's the reason I picked up this set myself. The Predators have been referred to as the “YautJa” and the “Hish” in Expanded Universe Material, as well. Oh cool! I had not heard that before! I've got these figures in my closet right now. I had 'em as a kid, and tracked down some MOC new ones a few months back. These came out just a little too late for me to really appreciate them as I would have when I was 10 or 11 years old. Awesome! I was the same. I was 12 when this particular set came out, and approaching my "too cool for toys stage." So I completely missed these as a kid. After opening up this set for this video, I'm very much interested in picking up some more. Heh. I have a MOC version of this I picked up new in highschool. The Kenner line is awesome!